NETWORK FINALS: The AMERICA’S GOT TALENT rerun and both MASTERS OF ILLUSION episodes lost 0.1 in final numbers. CABLE HIGHLIGHTS: Cinemax’s heavily hyped new original OUTCAST had a terrible start, premiering at 0.06, a number that makes BANSHEE look like GAME OF THRONES. The night was led by Discovery’s ALASKAN BUSH PEOPLE, steady with last week’s 0.68. Both Fox Sports 1 and Univision did well with the USA vs. Colombia COPA AMERICA match, respectively at 0.61 and 0.43. 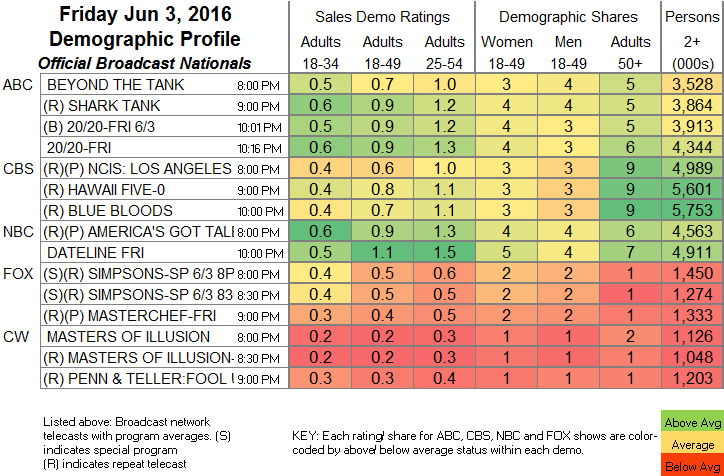 Disney’s GIRL MEETS WORLD returned at 0.42, after a 0.31 lead-in from STUCK IN THE MIDDLE, with lead-out TANKED at 0.24. We’s MARRIAGE BOOT CAMP was another returnee at 0.39, airing after a 0.21 special. On HBO, REAL TIME WITH BILL MAHER climbed 0.04 to 0.32, and VICE gained 0.07 to 0.23. Food Network’s DINERS, DRIVE-INS & DIVES was up to 0.31 after last week’s 0.23/0.22. 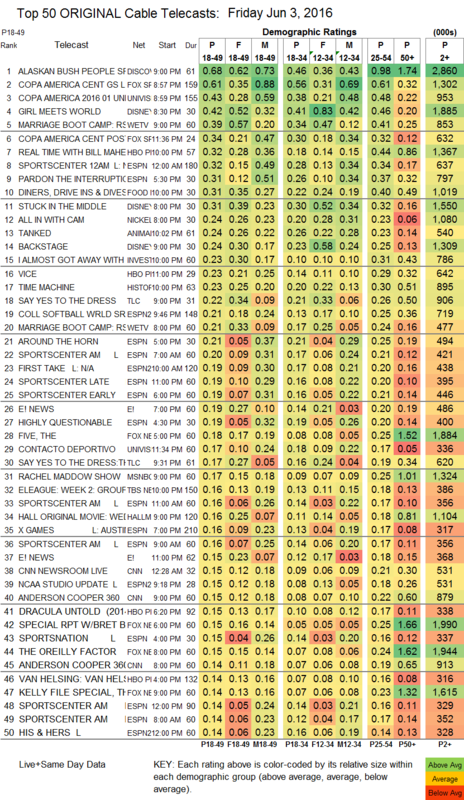 TLC’s SAY YES TO THE DRESS was at 0.22/0.17. Syfy’s WYNONNA EARP only seemed to benefit from the new horror competition on Cinemax, rising 0.05 to 0.13, and steady with its WWE lead-in.